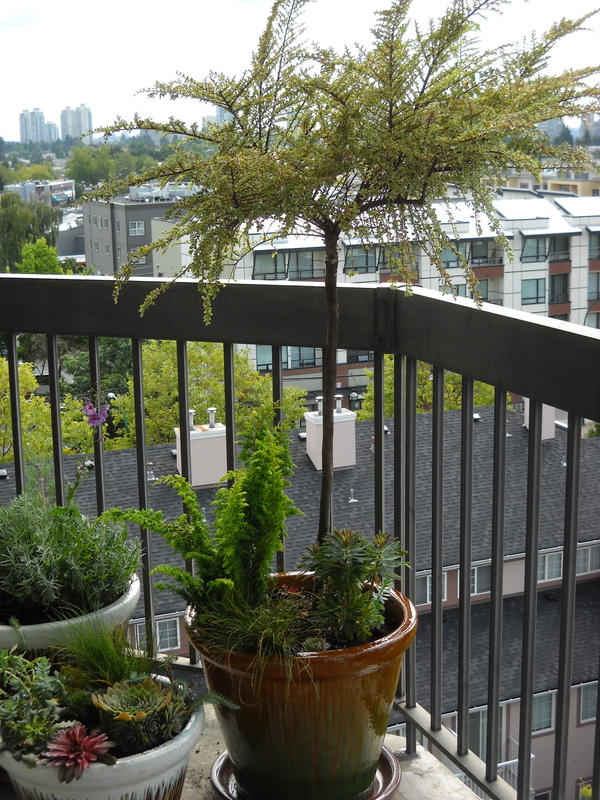 As promised, here’s another instalment of 5 Great Containers, this time a variant on the formula–“One Tree, One small Evergreen, One tall Perennial, One fluffy Perennial, One Grass”. I saw this amazing grafted Cotoneaster (some feel this is an artificial-looking device, but what is art but an artificial device? ), and had to buy it. My original plan had been to have two grafted PeeGee Limelight Hydrangea containers, an evergreen shrub container, a mainly perennial container, and a succulent container. 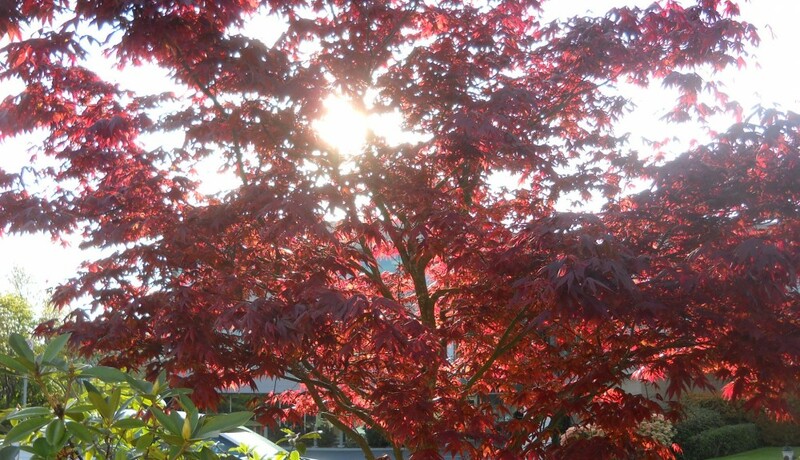 But when the PeeGee Limelights were sold out at my preferred nursery (and I was in quite a hurry to get these done), I chose the Japanese Maples instead. So seeing the grafted cotoneaster brought me back to the plan of having a tall item with still lots of space underneath for bulky plants. Hence what we have here. 1. Cotoneaster horizontalis ‘Variegatus‘. Here’s a shrub with 4 season interest, even tho’ it’s deciduous. (Who knew there was even such a thing as a deciduous cotoneaster?) 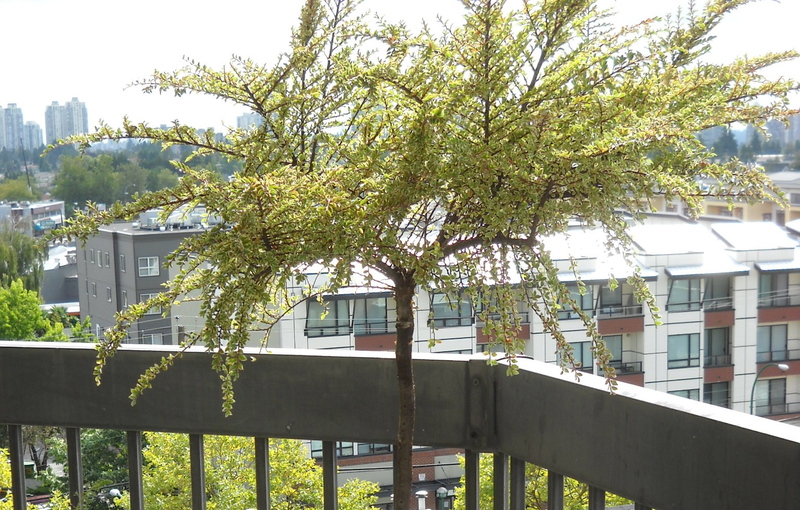 Tiny white flowers in the spring, red berries in the fall that should last into winter–especially here on the 7th floor balcony where the birds are unlikely to eat them. Then the creamy white edged leaves that turn pink-to-red in the autumn before falling. This is a 24″ diameter container, so lots of room for growth here. 2. Chamaecyparis obtusa (False Cypress) ‘Fernspray Gold’. One of my favourite conifer shrubs, I have this myself in my front garden. The colour becomes coppery as it gets cold–worried me the first year, then I discovered it’s a colour change, not a dying change! It comes back gold-to-chartreuse in the spring. The branches tend to “spray” out (hence the name) a bit like a fountain, so a great plant to have underneath the tall apparently lifeless stick of the grafted cotoneaster. 3. Euphorbia x martini (Dwarf Martin’s Spurge) ‘Tiny Tim’. Another favourite that I’ve previously killed in my own garden, this is another all-season plant. It’s evergreen–always a bonus. The ‘flowers’ in spring are actually bracts, not petals, like the “flowers” of the (also euphorbia) Poinsettia. So they last A LONG TIME. Tiny Tim in flower. Thanks to Log House Plants. 4. Pennisetum alopecuroides (Dwarf Fountain Grass) ‘Little Bunny’. Cutest little ornamental grass–kids will love it, not least because of its name. Because it’s small (mature size only 12-14″), it can easily be cleaned up in the fall (it is deciduous) so there’s no mess when it starts to grow again in the spring. Bigger grasses are a little more work to tidy up. 5. Finally just a few left-over Sempervivums (Hens and Chicks, also called Houseleeks) and Creeping Spurge (Euphorbia myrsinites) that will cover the soil in one season. 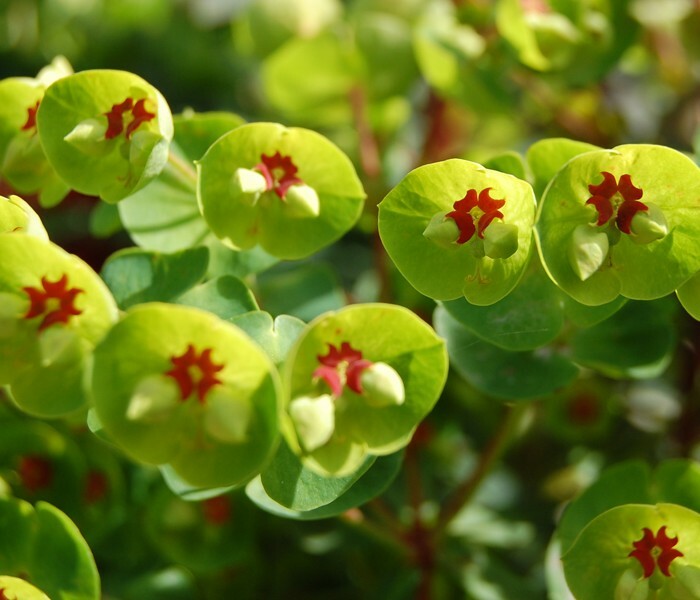 The Euphorbia will have the same flowers as the Tiny Tim, but without the red centre. There you have it, another fun container that will last for years, with a new look every year as the plants grow. And doesn’t look like anyone else’s! Questions? Comments? Criticisms? All welcome, and I’d be happy to reply to anything. 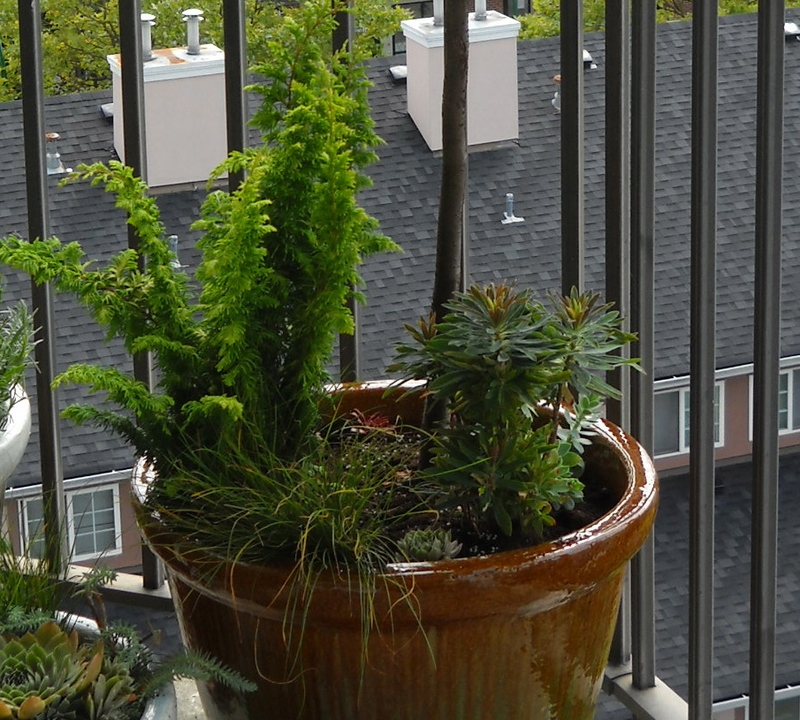 This entry was posted in 5 Things, Balcony, container garden, design, garden, landscape and tagged balcony design, chamaecyparis, container planting, Contoneaster, euphorbia, pennistenum, Sempervivum by Janet. Bookmark the permalink.